Welp, it’s happening: Trump is starting to execute on his campaign promises in the most hypocritical and unprofessional manner possible. Was it expected? I think so . Will it get better? Probably not. It’s going to be a long and crazy ride. And we are in it together. 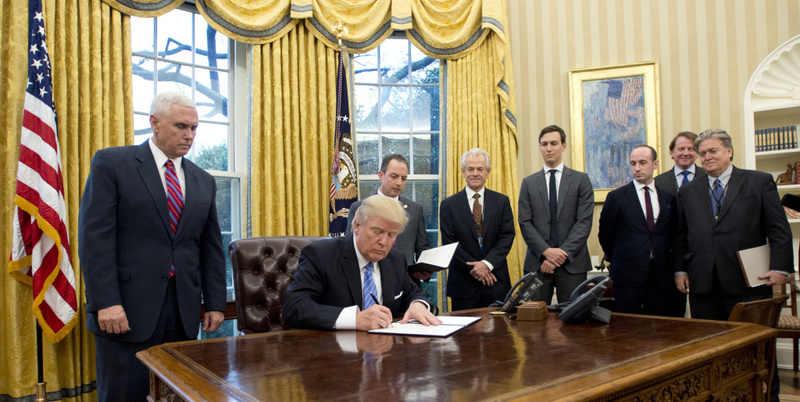 On January 28, 2017, Trump signed an executive order about refugee restrictions and temporary provisions aimed at limiting immigration and travel to the United States from Iraq, Syria, Iran, Libya, Somalia, Sudan, and Yemen. However, there are other predominantly Muslim countries that do have a history of supplying terrorists to the US. For example, terrorists involved in 9/11 attacks were from Egypt and Saudi Arabia . Following Trump’s logic, those two countries and a few others should be included on the list as well. Also, according to Trump’s administration, it’s not a “Muslim ban.” This means that other countries that supplied terrorists, like Russia—think Boston Marathon bombings in 2013 , should be on the list as well. Trump registered eight companies tied to hotel interests in the country [Saudi Arabia] shortly after launching his campaign in August 2015, according to The Washington Post. The companies were registered under such names as THC Jeddah Hotel and DT Jeddah Technical Services; company names The Post reported bore striking resemblance to ones Trump has registered in other foreign countries. I think this is the definition of hypocrisy and outright lying. No one can support it with clear conscience, since it just doesn’t make any logical sense (again, unless I am missing something major). I am particularly disappointed in the Republican establishment that didn’t condemn this executive order due to inner GOP political games. I think it’s an example of cowardice. I voted for some Republican congressmen in the past but from now on I will be extra careful and thoughtful while researching my options on the ballot every two years. Why did Trump sign this illogical executive order? There are several theories going around and at this point I strongly agree with one of them. I think he simply wanted to deliver on his promise to “secure our borders” and “protect Americans from radical Islamists.” He wanted to create the appearance that he was following up on his campaign promises. And so he did in the most hypocritical and dishonest way possible. I wouldn’t generally trust Giuliani, but in this interview he was actually defending the ban and Trump, so the “Muslim ban” remark should be taken pretty seriously. There we have it: a lopsided executive order discriminating against Muslims from the countries where Trump doesn’t have business interests. Here is something else to consider . . . would this executive order be any good if it only included countries that supplied terrorists to the US in the past? It’s probably a topic for a different article but I think it would still be a terrible idea. In 2006 I came to the US as a Russian immigrant. Today I am an American who contributes to this country culturally through socializing and writing and monetarily through taxes and consumerism. I am forever grateful to Americans who accepted me for what I was and helped me become successful in so many different ways. I would not be able to make it on my own without this kind of help and kindness. I consider American acceptance and tolerance to be one of the strongest forces in the modern world. It makes us better and gives hope to those who can’t succeed in their countries of origin due to reasons beyond their control. Implementing a catch-all executive order that ruins the lives of thousands through immigration twiddling, for no real value, is fundamentally un-American. What is American is how the people responded. Thousands gathered at the nation’s largest airports to protest against a cowardly government. Lawyers (lawyers!) spent hours working for free to figure out how to get the detainees in . Get educated: read the latest news and do your own research. Spread the word: be it Facebook, Twitter, or a personal blog. Share your thoughts and findings. I think it’s valuable to see all citizens contribute to the conversation. Donate: support organizations that are fighting the good fight. I personally recommend looking into the Cate Institute  and the ACLU , but please do your own research before donating. Protest: get out on the streets whenever there is an organized lawful protest.